China's ZWSOFT has released ZW3D 2017 with improvements to the suite's CAM Sheet Metal and CAM modules. To begin with, ZW3D 2017's Sheet Metal improvements encompass a number of flange options. First on the list are enhancements to Full and Partial Flange controls. Now users will have access to more intuitive dimension controls, expanded options for S-blends, a series of flange length types, optimized miter flanges and support for close corners. ZW3D's Swept Flange controls have also been upgraded with the command now supporting opened and closed tangent paths. 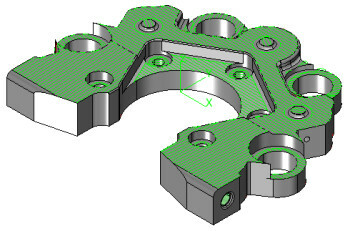 The Swept Flange feature can also accurately unfold sheet metal results to show designers a flat pattern. Building off of those improvements, ZW3D 2017 also includes a new Hem Flange tool that hosts a library of predefined hem types. The tool also supports miter hems. ZW3D's new CAM tools have focused on reducing CAM programming times. To that end, the software's engineers have added a new Flat Finishing operation that can detect all planar faces on a part and generate appropriate tool paths for each flat region. According to ZWSOFT, this new tool can reduce CAM workflow times by up to 50 percent. A new tool has also been added to the ZW3D 2017's CAM suite. CAM techs will now have access to a Form Cutter Engraver that can be used to create 2D and 3D engraving patterns. These new engraving patterns are also supported in milling simulations so that users can preview the results of an engraving operation. Finally, ZW3D now includes a Turning Simulation feature that will give users the ability to see how a turning operation will behave before they ever chuck stock up to a lathe. Other features in ZW3D 2017 include greater translator compatibility. ZW3D 2017 can read PMI data from a number of software packages, including CATIA V5 and V6, NX, Creo and SOLIDWORKS. Additionally, a Dynamic Section View tool has been added to the ZW3D package so that users can interactively scan through the interior of a design. For more information about ZW3D 2017, surf here.